brand new characters! we’re home in the Court of Swords! I just have to say: very impressed that not a single peasant died. I expected not a single one to survive. Silly question, but does the jug count as a magic weapon for purposes of bypassing resistances? Great start to a new adventure. That’s an amazing piece of art. Whoa! This is so good - I love old man Krill especially. I love the new characters and I can’t wait to see them develop more. Great to see Ramus again, he’s still holding in there. Really looking forward to seeing how Berg interacts with everyone next week. Also would love to get a flashback to when Berg and Ramus parted ways with Kali… and was there someone else at that campfire after the fall of the City of Brass? Nah… memory must be fuzzy and it was a shadow. Krill’s voice changed, old man Ramus has a distinct look about him, and I love this sketch. Berg might be super protective of his old and frail friend. He has the eyes of heaven looking favorably upon him, for whatever reason… and should he start bestowing gifts on his allies, like a devout person would, then this thing could go haywire. As it should… Because I think Berg is the tool that Adam described in the prep show. Wait a goddamn second. I just realized something that should have been posted in last weeks post but am doing it here. Since Yoji have wished to be forgotten about, you said the jar in heaven that has his soul just broke and flew away and the Heaven big book his name erased, meaning all knowledge of his existence is destroyed forever. For there are outsiders who have invaded the universe and are not beholden to it’s laws and the wheel. Also the fact that while he physically alive because of some occult ritual, the lack of his soul in combination of the fact that every new memory of him is erased immediately means he’s essentially invisible in the universe to everything in it. This can be connected to the whole lore bit tens of episodes ago being how humans made a deal with gods and how the soul is a lie made by the Gods, told to the humans. The implications if all of this truly connects can mean much. Were humans ever part of the wheel in the first place? Is the big bang plan made by Heaven actually to expand its universe, destroying the planes of existence around it to take it over? Is Heaven actually a secret all powerful corporate entity with nefarious plans? Are the Mara committing a guerrilla operation to take back what;s theirs from the Gods in Heaven? Is the power of choice presented to the players so far an illusion when all paths have already been decided for them in one way or another? Great episode all around. Love that Ramus is back and the new characters are really cool. Also 10/10 pun name Zeke. 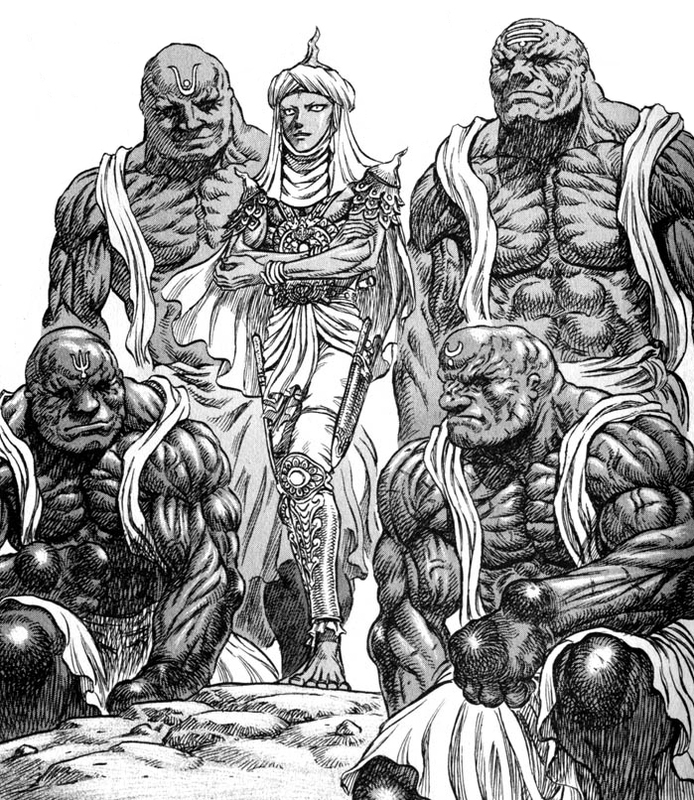 This is basically Ramus and the rest of the party in this new Arc, image taken from Berserk (If you haven’t read this manga and you like Dark Fantasy then it’s time to do it ). It counts as monk weapon for Zeeks PC, so it does. I think only unarmed strikes are magical not monk weapons. But it’s irrelevant since they are one level away from everything he does being a d8 so it makes sense for it to count as magical. 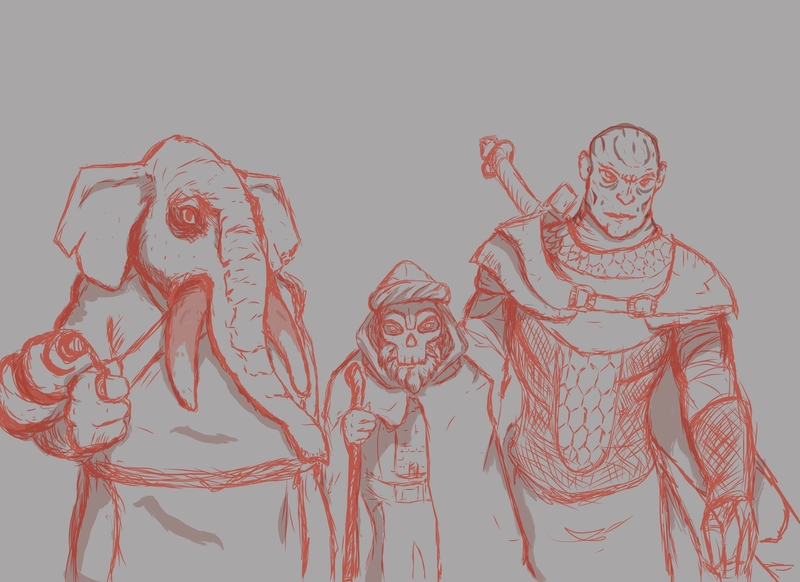 Loving the new characters I’m excited to see the brute squad at work. I love how the previous party were assholes who would kill anyone but could talk their way out of anything if they wanted to and could be stopped by a heavy door. And this party seems to be nicer but will be forced to fight because them talking their way out of problems will be far and few between. So excited they are back where it all began. The jug itself is a magical item so it wouldn’t be weird for it to count as a magical weapon.